The Rattlesnake Creek Watershed Group works to educate, inform, and engage the greater Missoula Community, and to organize coordinated stewardship of the Rattlesnake Creek Watershed among numerous agencies, organizations, businesses, and individuals. Here, we provide information on our current projects. 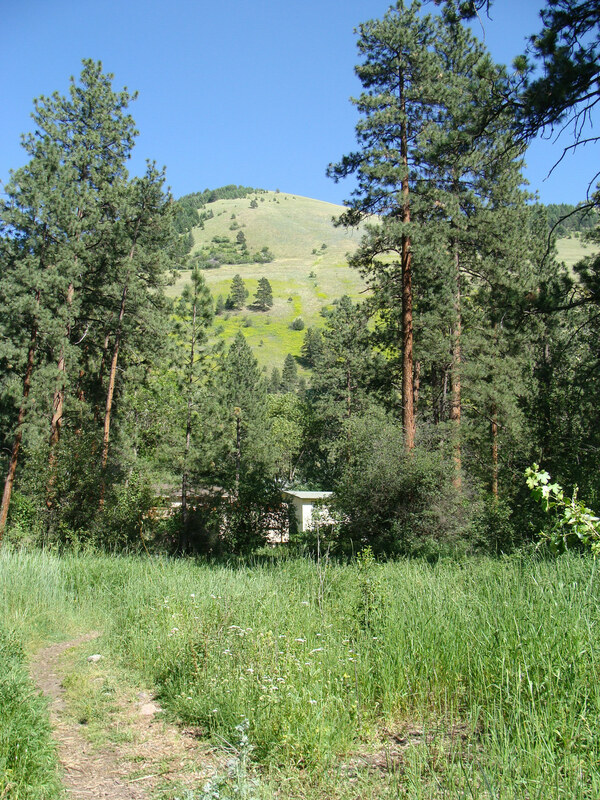 Since our inception, we have focused our on-the-ground restoration work in Bugbee Nature Preserve, located off of Missoula Avenue about a mile from Broadway Avenue. Missoula County has worked to maintain Bugbee as a natural area and public park since 1975 when The Nature Conservancy on behalf of Henry Greenwood Bugbee, M.D., (1879-1945) deeded the area that now makes up Bugbee Nature Preserve to the County. Over the last four years, with the help of community members and support from the County, the RCWG has worked to pull two acres of tansy (Tanacetum vulgare) from the area and plant over 200 native riparian plants in its place. Wild rose, serviceberry, currants, dogwood, choke cherry, willow, and others now seek to reestablish riparian habitat and function to this stretch of Rattlesnake Creek. Our effort demonstrates how invasive plant maintenance can succeed through sustained community involvement and public support. The Missoula County Water Quality District, the Missoula County Weed District, Wildland Conservation, and the Montana DNRC Conservation Seedling Nursery have been integral in our effort to restore and maintain Bugbee. However, our work continues. If you, your school, business, or community group would like to participate in our effort to steward Bugbee Nature Preserve, please contact us. The Rattlesnake Creek Community Stewardship Program is a new program for the RCWG, one that combines three years of stewardship work in Bugbee Nature Preserve with our desire to engage more community members in actions that contribute to increasing the health of our watershed and native trout populations. The purpose of the program is twofold. First, it aims to teach adults and youth about the wild and native trout populations, birds, wildlife, and plants that inhabit Rattlesnake Creek, the riparian and aquatic habitat the creek supports, the water storage and filtration functions the creek and surrounding watershed provide, and existing threats and opportunities. Second, it aims to engage residents in identifying existing threats to species, habitats, and ecosystem functions, and participate in opportunities to enhance watershed resilience. The program intends to empower adults and youth with the knowledge and skills needed to make a difference on behalf of our watershed. The first workshop is happening Tuesday April 17, 2012! See our Events page for more information. Thanks to the Western Native Trout Initiative for providing funding support, and to the Clark Fork Coalition, our organizing partner. RCWG has partnered with Trout Unlimited, the Missoula Valley Water Quality District, and the Clark Fork Coalition to conduct surface water and storm water collection and assessment. Storm water samples will be collected in the lower Rattlesnake at the I-90 bridge and at the Railroad bridge. Surface water samples are collected at upper, middle, and lower Rattlesnake creek. The City of Missoula wastewater treatment plant evaluates all samples and shares the results. Results are available from three years of surface water sampling. Water monitoring offers a great volunteer opportunity for interested individuals. Please contact us to get involved. With funding support from the Montana DEQ and DNRC, the RCWG has spent the last two years collecting data, compiling existing information, and developing plans for conserving and stewarding the Rattlesnake Creek Watershed. Through our work, we’ve determined the minimum biological flow needed to support Rattlesnake Creek fisheries and developed a voluntary drought management plan and homeowner water efficiency plan to ensure water levels remain above the minimum, particularly in late summertime, and can support all water users. We’ve surveyed the entire 26-mile length of Rattlesnake Creek to document current habitat conditions and prioritize restoration and remediation actions. We’ve surveyed and learned from irrigation ditch managers, scientists, residents, and federal and state agencies about ways to improve and efficiently maintain the six irrigation ditches in the Rattlesnake Creek Watershed, and are developing a cooperative ditch maintenance plan to make sure water rights holders may access water for beneficial uses and fish and their habitat receive minimal to no impact. And, with the information collected through all of the above, we’ve developed a watershed action plan to implement our plans and accomplish our goals and objectives. More information to come. Check back for updates. The RCWG is working with Montana Fish, Wildlife, and Parks and the University of Montana to collect samples of algae from Rattlesnake Creek. FWP Fisheries Biologist Ladd Knotek has noticed increasing algae growth through low and high water years in Rattlesnake Creek and other nearby, important native trout streams. Concern exists that an algae species known to become invasive, didymo (Didymosphenia geminata), may be present in these creeks. With guidance from University of Montana Professor Vicki Watson, Montana FWP and the RCWG will work to collect algae samples in late summer and send them off to experts for identification.